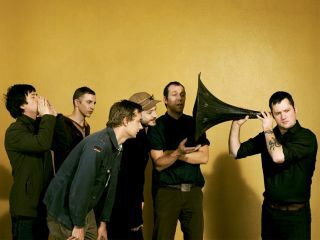 Modest Mouse with Johnny Marr (far left): "It's just a temporary arrangement lads, honest"
Ex-Smith Johnny Marr's desertion from Modest Mouse last summer was supposed to be a temporary arrangement. But while the fruits of his new project with The Cribs are showcased next month, Modest Mouse have been forced to go it alone. The US-based rockers have announced a 12-date North American tour. They've replaced Johnny Marr with former Grandaddy guitarist Jim Fairchild, although according to the band's publicist, Marr is still a member of Modest Mouse.